Thank you again for your many thoughtful and informative posts. Thanks again Cy, always informative. Do you know whats the cost of Ga68 scan if you have no insurance and is not from the US? Collie, I only know that the scan costs $3,400 without insurance at the Rocky Mountain Cancer Center. Sorry. I would like to know where I can find more information on the CA 68 scan and were I could get it done . Thanks for the post. I’ve had one of these scans and it’s wonderfully detailed, highlighting growth that other scans ‘cannot reach’, and therefore giving medics much batter insight. I do feel it would be valuable for people to know that considerably higher levels of radioactivity are involved, from the Ga68 material. My hospital used special handling techniques, including a lead-shrouded syringe – and I was told not to be close to any small children for up to 24 hours after the scan, to give the radioactivity time to disperse. I only mention this so that folks are not alarmed if they undergo this – the procedures that hospitals use are to protect staff who repeatedly handle the radioactive material (which could cause a cumulative effect, if they weren’t protected). I personally experienced no ill-effects whatsoever. Alan, you are exactly right. 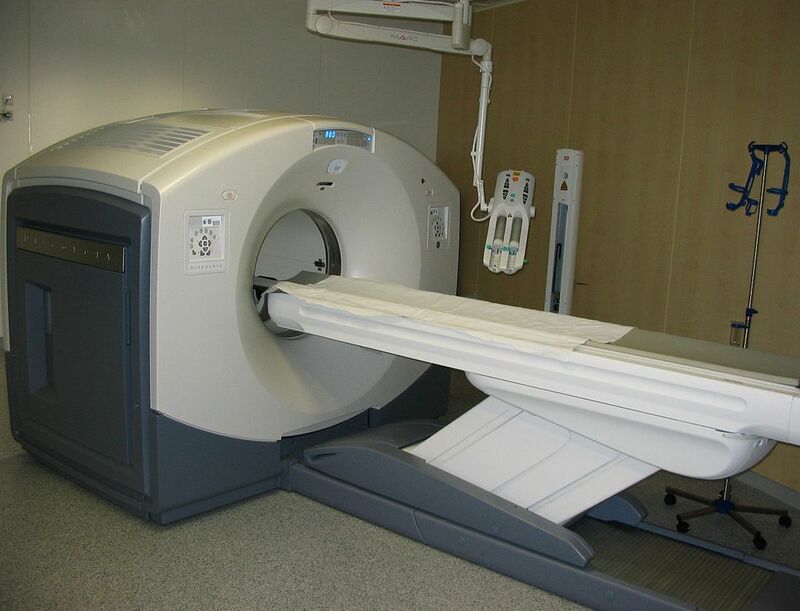 These scans are designed and tested to insure that the radioactivity is safe for the patient. As I have said before, my body won’t care how much radiation I get if I die for NETs because I was not scanned enough to find and treat the cancer. Cy: thank you for this write up. Clears up alot of questions and you explained it well. this cancer is a learning experience. and to have a wonderful group that informs others what they have gone through. Thank you. and God Bless. Dr Woltering has scheduled me for a GA 68 scan in October. I appreciate your information and I ‘m hoping he finds my tumor which has been hiding for 5 years. May you get the best possible pictures. Thanks for sharing this with us Cy. You explained things in a way we can all understand. 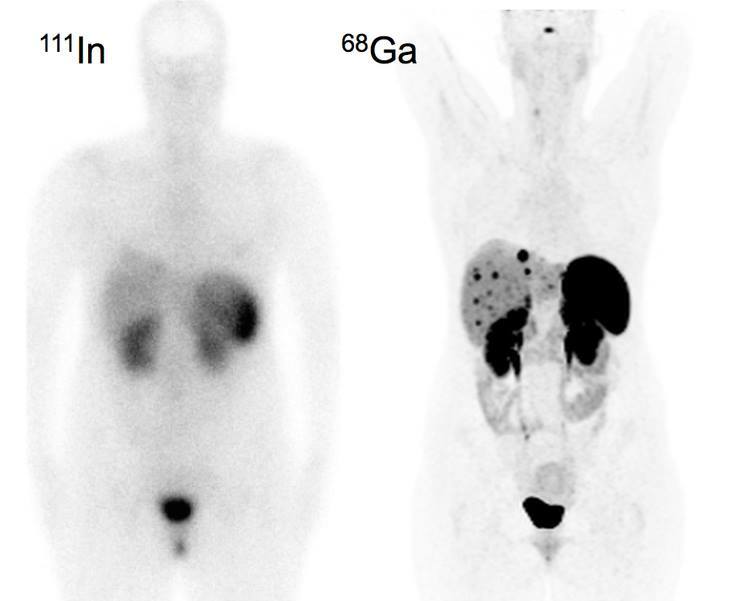 How can you tell which parts are the tumors by looking at the scan. I had scan even it shows my kidneys and bladder black in the scan and I am waiting for my appointment so worried. 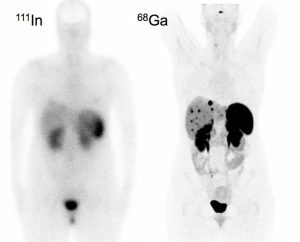 The scan shows kidneys and bladder black because they are processing the leftover radiation out of your blood stream and into your urine. There is also a gland that will show black (pituitary behind your eyes) but is no problem. You need to have the appointment hopefully with a doctor who has experience reading these. Without training, we patients cannot do it properly. Have the best possible outcomes. Appreciate your information. My husband is waiting to get this scan after 3 years post op from pancreactic cancer. Problem we are having is getting it approved thru our cancer center. We live here in south Florida and it is sad that the large local cancer center does not have the prodical set up yet to start doing these importnat scans!! There are numerous location in the state that are hours away!! Hopefully he can get this set up soon and get the diagnosis. Thanks again!! Wow! Thanks for this great information. I have NETs and live in Brazil. I can’t find specialists here. Information is everything! Thank you for your information, I will be having this scan very soon and feel less nervous about it now, thanks! I had a hospital bill $23,680 for the Indiom -111 isotope used in Oscan. Got a $5000 surprise bill in the mail.